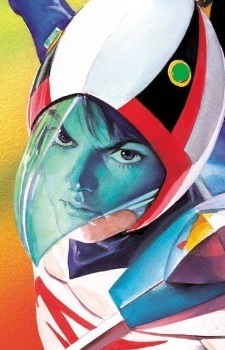 As The Gatchaman, Ken is the showman—the super spy, martial artist and ninja. He's quick and charismatic, and don't let those big blue eyes fool you—he's a hell-raiser who constantly takes foolish risks. He is amazingly inept at romance, either too heavy-handed or totally ignorant of the girl's feelings. He might do this because he feels a romantic relationship would interfere with his duty... or maybe he's just dense. Ken seems happiest when he's up in the air, flying alone in his little "Cessna" or testing some new flying machine. He spends most of his social time at the Snack Jun, running up a tab he never gets around to paying. Ken's goals are noble enough—to restore peace to the world—though for a short time, he fights to avenge his father's death. The burden of leadership lies heavy on his shoulders, especially during the final escalation of events at the end of the series. Cover Occupation: Test pilot. Also works part time delivering airmail to remote locations and doing other odd jobs which require the use of a small plane. Lives in a small shack beside a private airstrip, on a few acres of land willed to him by his father.